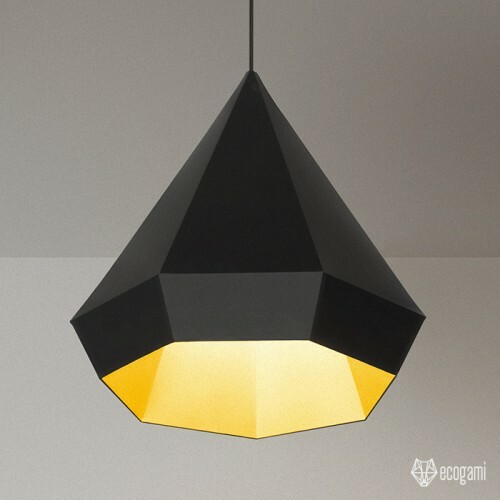 Make your own paper DIAMOND lampshade with our printable PDF pattern! Follow the instructions & you will be proud of your minimalist ceiling light. Isn’t it a nice & modern lampshade to decorate one of your rooms? This model is easy & quick to assemble. Don’t be afraid, I assembled the sculpture, so everybody can do it! You will just need time & precision. Put your music on & enjoy the assemblage! (For me it is a perfect way to relax). For this model, I painted the outside in black and the inside with gold paint. ► Difficulty Level: Easy – This lampshade is easy and quick to assemble. However, closing the sculpture requires precision and patience.